I was amazed at how quickly this came together, it all went down like how the Simpsons fly into their living room at the beginning of each show; also known as the 'couch gag'. This time, instead of creating a controversial intro clip lampooning the Chinese manufacturing industry, like Banksy did, we all got to sit down to a nice meal. 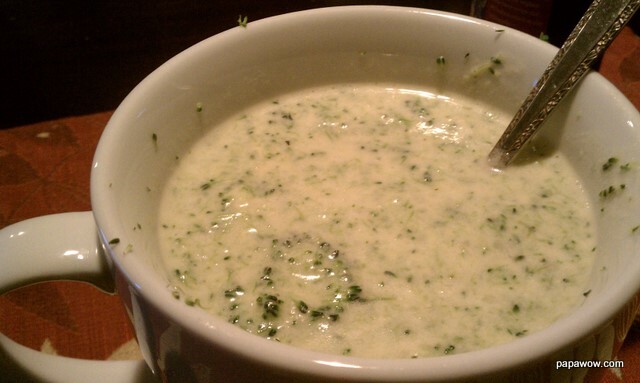 This was adapted from the Cheddar Broccoli Soup from The Wives with Knives because they have such a charming tone and the photos to prove it. Thanks. Steam the broccoli first. I used the microwave by nuking the pound of broccoli in three batches and zapping them each batch for 60 seconds at a time. They will cook more in the soup so you only need to par-cook them. In a large pot over a medium-high heat add the butter and the onions and cook until soft; after a few minutes add the Better than Bouillon and pepper, keep stirring to prevent browning. Once the onions are soft add the flour and stir quickly and throughly to form a rue. Cook the rue for about 2 minutes, stirring continuously, and add the chicken stock - slowly at first, stirring quickly to avoid clumping. A whisk may be used to incorporate them with some alacrity. Once they are one, add the milk and stir well; keep the heat on medium to prevent the milk from separating. Add the cheese and the cayenne, stir for a minute or so, then add the broccoli. Break out your immersion blender (AKA stick blender), or transfer the soup into a processor or blender and work in batches. Don't blend completely, little wholesome chunks of broccoli are half the fun. Taste and add salt & pepper as needed. Serve hot. Makes 4 bowls.